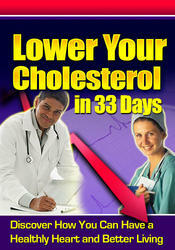 LDL cholesterol = total cholesterol -(HDL cholesterol + triglycerides/2.2) using SI units of mmol/L. curate and LDL cholesterol must be directly measured. 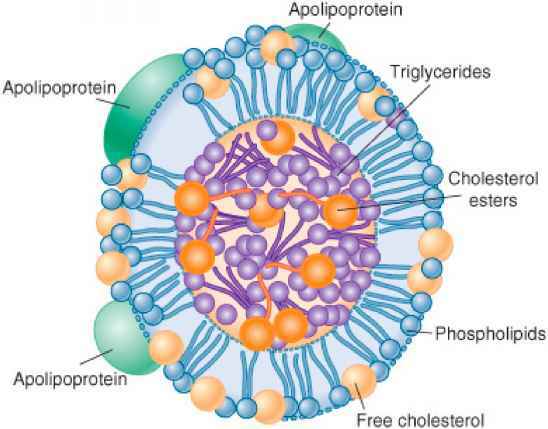 Each lipoprotein has various proteins called apolipo-proteins (Apos) embedded on the surface (Fig. 12-1). These Apos serve four main purposes, they: (a) are required for assembly and secretion of lipoproteins (such as Apos B-48 and B-100); (b) serve as major structural components of lipoproteins; (c) act as ligands (Apo B-100 and Apo E) for binding to receptors on cell surfaces (LDL receptors); and (d) can be cofactors (such as Apo C-II) for activation of enzymes (such as lipoprotein lipase [LPL]) involved in the breakdown of triglycerides from chylomicrons and VLDL.4 Apos A-I and A-II are major structural proteins on the surface of HDL. Apo A-I interacts with adenosine triphosphate (ATP) binding cassette A1 and G1 to traffic cholesterol from extrahepatic tissue (such as the arterial wall) to immature or nascent HDL. Cholesterol from the diet as well as from bile enters the small intestine, where it is emulsified by bile salts into micelles (Fig. 12-2). These micelles interact with the duodenal and jejunal enterocyte surfaces, and cholesterol is transported from the micelles into these cells by the Niemann-Pick Cl Like 1 (NPC1L1) transporter.5 Some cholesterol and most plant sterols, which are structurally similar to cholesterol, are exported back from the enterocyte into the intestinal lumen by the ATP-binding cassette (ABC) G5/G8 transporter. Cholesterol within enterocytes is esterified and packaged into chylomicrons along with triglycerides, phospholipids, and Apo B-48 as well as Apos C and E, which are then released into the lymphatic circulation. In the circulation, chylomicrons are converted to chylomicron remnants (through loss of triglycerides by the interaction of Apo C-II and LPL). During this process, chylomicrons also interact with HDL particles (Fig. 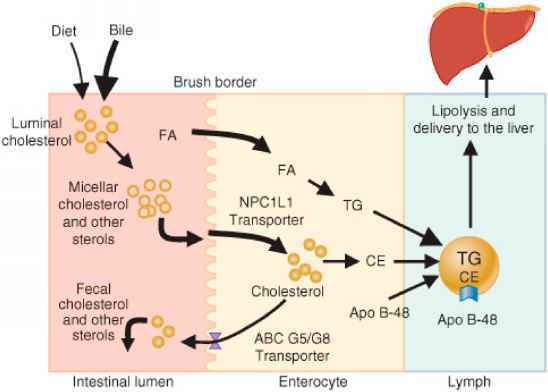 12-3) and exchange triglyceride and cholesterol content, and HDL particles acquire Apos A and C. Chylomicron remnant particles are then taken up by LDL-related protein (LRP). 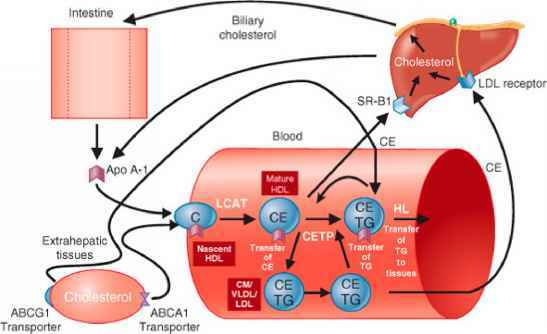 Cholesterol is transported from the arterial wall or other extrahepatic tissues back to the liver by HDL (Fig. 12-3). Apo A-I (derived from the intestine and liver) on nascent HDL interacts with ATP-binding cassette A1 (ABCA1) and Gl transporter on extrahepatic tissue. 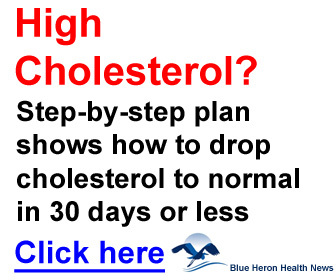 Cholesterol in nascent HDL is esterified by lecithin-cholesterol acyltransferase (LCAT) resulting in mature HDL. The esterified cholesterol can be transferred as noted above to Apo B-containing particles in exchange for triglycerides. Triglyceride-rich HDL is hydrolyzed by HL, generating fatty acids and nascent HDL particles, or the mature HDL can bind to the scavenger receptors (SR-BI) on hepatocytes and transfer their cholesterol ester content for excretion in the bile. A variety of genetic mutations occur in the above steps during lipoprotein synthesis and metabolism that cause lipid disorders. The major genetic disorders and their effect on serum lipids are presented in Table 12-2. Disorders that increase serum cholesterol are generally those that affect the number or affinity ofLDL receptors (also known as Apo B-E receptors) known as familial hypercholesterolemia, or the ability of Apo B-100 to bind to the receptor known as familial defective Apo B-100. These patients commonly present with corneal arcus of the eye and xanthomas of extensor tendons of the hand and Achilles tendon. Elevations in triglycerides are generally associated with overproduction of VLDL, mutations in Apo E, or lack of LPL. Patients with extremely elevated serum triglycerides can develop pancreatitis and tuberoeruptive xanthomas. Most individuals have mild to moderate elevations in cholesterol caused by a polygenic disorder. Polygenic hypercholesterolemia is not as well understood as the single-gene disorders discussed above. Polygenic hypercholesterolemia is thought to be caused by various, more subtle genetic defects as well as environmental factors such as diet and lack of physical activity.